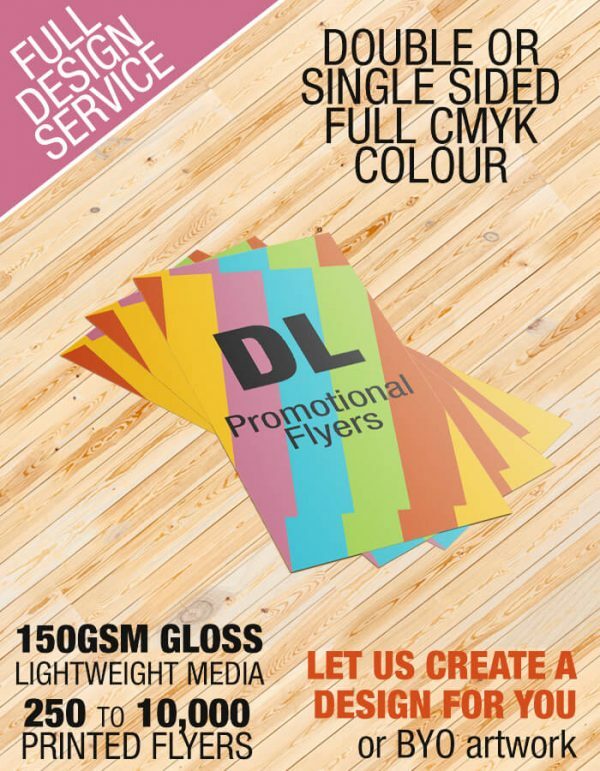 Are you looking for some eye catching Flyers for your next round of advertising? We are experts in promotional material and we are here to help you get the best value for you money. We can supply you with flyers in a range of sizes and create an full design for you to make your brand and business stand out above the rest. You have two options for Design choices. You can bring your own Design and Art to us and we can get it printed for you. Preferable we can create a whole design for you, You come to us with your idea’s and we will translate that into a Promotional flyer for you. Our design team will work with you to achieve what you envision and how you want to promote your brand. Our Design team are experienced and have spent time in the Promotional marketing field, so you can have confidence we can create an visually eye catching and informative design for you. All our Promotional Flyers are supplied on a lightweight 150GSM Gloss media in full CMYK colour. 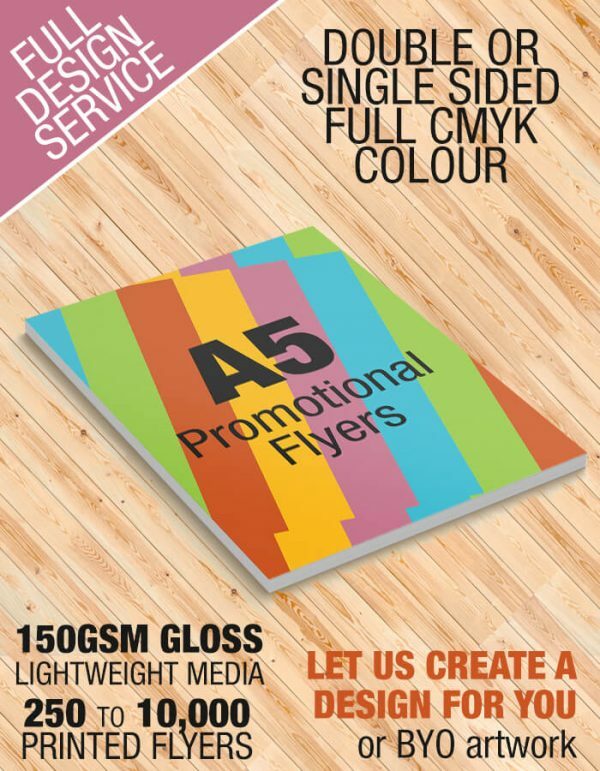 Our most common(And Personal favourite) size for Flyers are the A5. 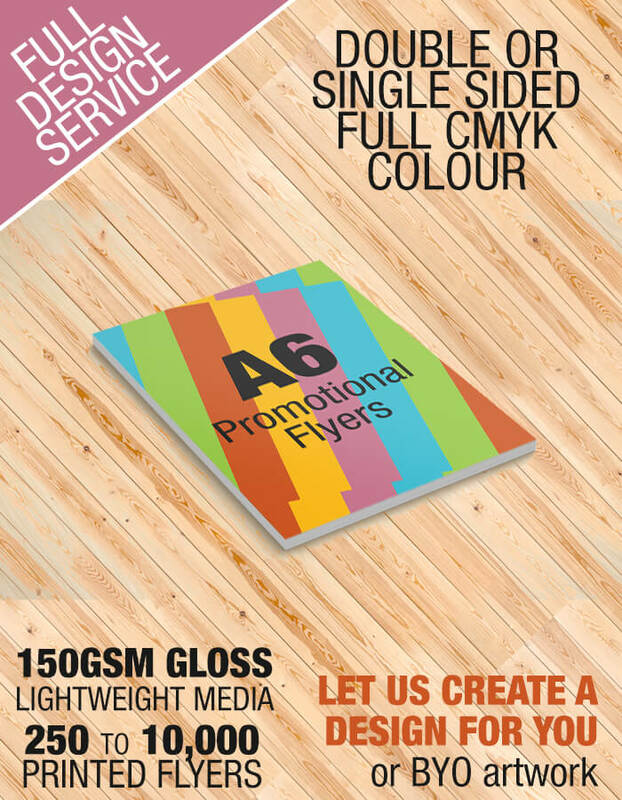 They are big enough to grab the attention of the intended customer, and fit enough information on but easily fit into letter boxes and are easy size to hand out to customers. 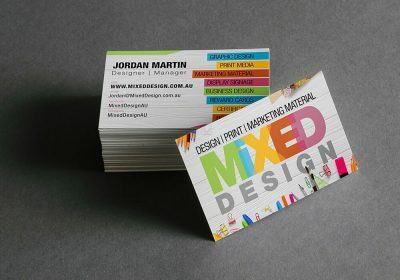 We have the options for single sided printing or double sided printed flyers. Our Process times depends on if custom designs etc are required. It will take us longer if we are creating a full design for you. For printing times please allow at least 3 BUSINESS days up to 10 Business days turn around from approval of artwork. If you need these quick, Please contact us and let us know first. Design times. We will be in contact within 2 business days from purchase to discuss designs and artwork. Please feel free to message us if you would like to discuss the designs before purchasing and what we can do.